To first download users need to select the packages to be installed by default, to which users can also add new packages and updates their existing Webserver Setup, from MoWeS Portable. 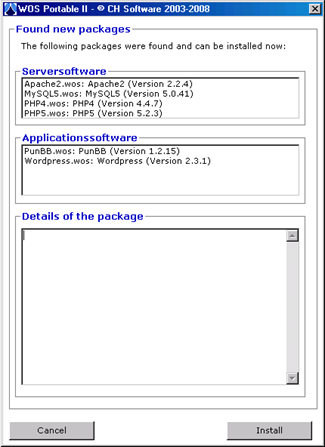 Different versions of Apache,PHP,MySQL and other CMS and Scripts are available and atleast one version of Apache,PHP and MySQL needs to be selected for setting up a webserver.After selecting your required modules, the download size and the after extraction size are shown for user convenience. Similar Post Hide Windows of All Running Programs At Once In Windows Using WinRAP. Installed Mowes, built site. Can’t get it out of Mowes. Wish I never heard of Mowes.